Arizona bill: To veto or not to veto? Does freedom of religion mean freedom to discriminate gays? 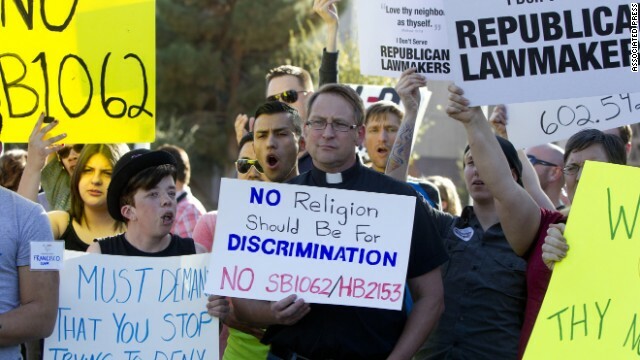 That's what could happen with Arizona's controversial SB1062 bill. So Governor Brewer has a tough decision...to veto or not to veto? At 6:30pm ET on Crossfire, former Virginia Attorney General Ken Cuccinelli and CNN Commentator LZ Granderson debate the bill with Van Jones and Newt Gingrich. We want you to weigh in: If you were the Governor of Arizona, would you sign or veto the bill? Vote by tweeting Sign or Veto using #Crossfire or comment on our Facebook post. View results below or through our Poptip results page. If you are a Christian and want this law, think about the Golden Rule. Do you want people from a different religion to discriminate against you? Do you want people from a different religion to stop serving you because you are a Christian? If you don't want other people to discriminate against you, don't discriminate against other people. Arizona, and every other state, needs to have laws that protect, not discriminate. Christians already have protections. Gays do not. It's legal in Arizona to fire or deny housing to someone who is gay. I don't see Christians getting fired or tossed out onto the street for practicing their chosen lifestyle. Christians choose to be Christian. Gay people do not choose to be gay. The latest demographics I could find on Twitter had around 20% of the people tweeting, most of the them young, urban, and minority. Until you get a more relevant tool, or tweets increase, your twitter polls remain irrelevant to the public, not to mention biased. While that's true to some extent... the youth on twitter's opinions are of import because as time passes... theirs are the opinions that will become the majority. Those who are older will age and die and the opinions they held that were formed 50-60-70 years ago will go with them. The opinions of that younger demographic will become the standard. You're seeing that with the issue of gay rights already. The youth in the 90's were already beginning to favor gay rights. But at that point they were only about 20% of the vote. Now that 25+ years have passed and the strongest opponents of gay rights have died of old age... those youngsters from the 90's who are now in their 40's along with the youth from today now make upover 50% of eligible voters. And the trend will continue as more time passes. When the views of your party are inline with the older demographics but out of tune with the younger demographics... particularly on social issues... you've got a problem. People's financial views can change as they age and their financial situation changes. Social views change less often and less drastically. This is why the GOP needs to reverse course on this (along with many other social issues). They can survive another election cycle or two without changing and even win some. But the longer they wait to bow to the reality of demographics, the harder time they'll have recovering with those demographic groups when they finally do change. what about individual rights?why dont we pass laws to protect them?while i dont find race creed or color important as to how i treat people,i do believe if others do they have that right and i have the right not to patronize their buisness,unless i missed where the lawmakers passed a law where and with whom i may do buisness with. The protected classes under US civil rights laws (race, religion, age, gender, sexual orientation, genetic information, pregnancy, familial status, etc) prevent businesses from discrimination in regards to hiring and ALSO applies to who businesses serve if they are in the public arena. Because of this, we don't have diners in the south with signs saying "Blacks not served here" like we did in the past. This law would allow those back. You could create a religion that dispproves of black people and have signs that say "Blacks not served here". Christians could put up signs saying "Unwed mothers, homosexuals and non-christians not served here". Imagine other religions refusing to serve you because you're christian. The days of segregation were not a good time in our country. We don't need to make that somehow "okay" as long as you say it's your religious beliefs that are your reason for being a bigot.